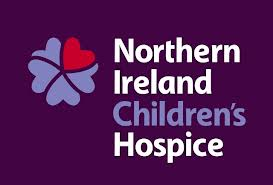 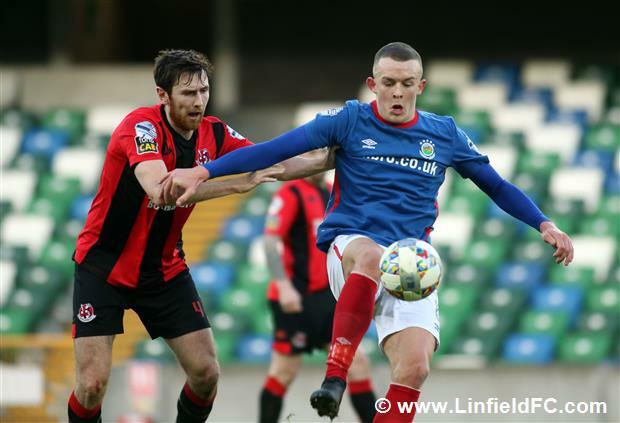 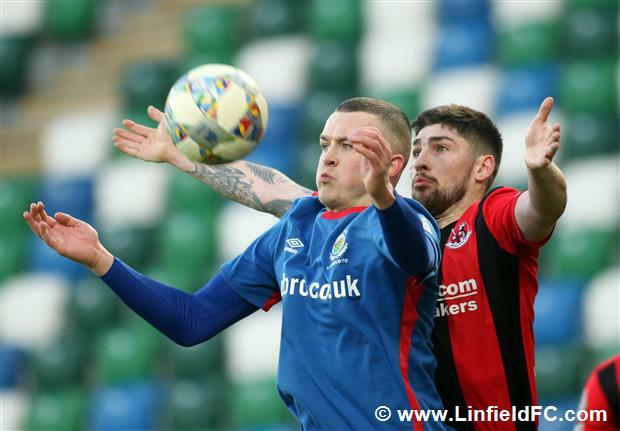 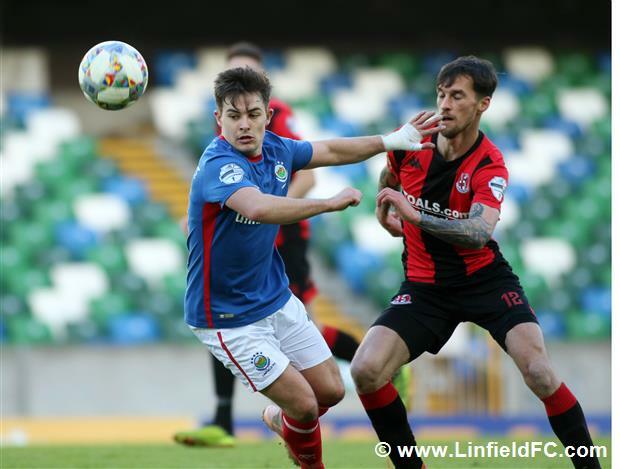 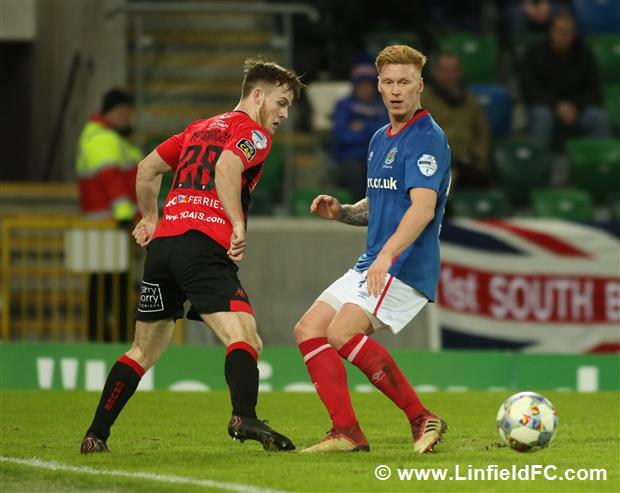 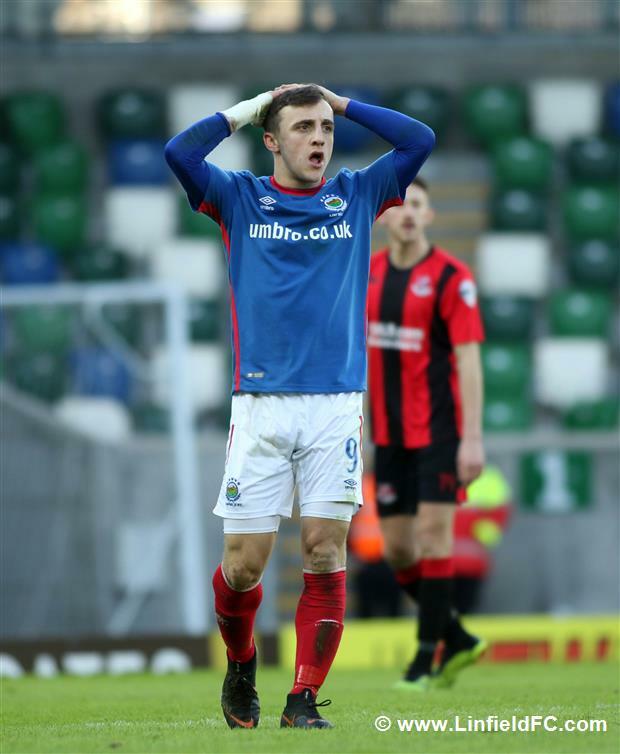 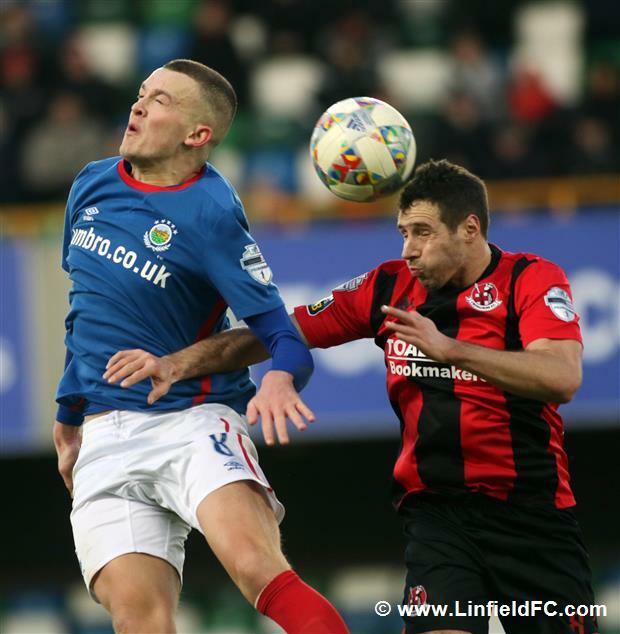 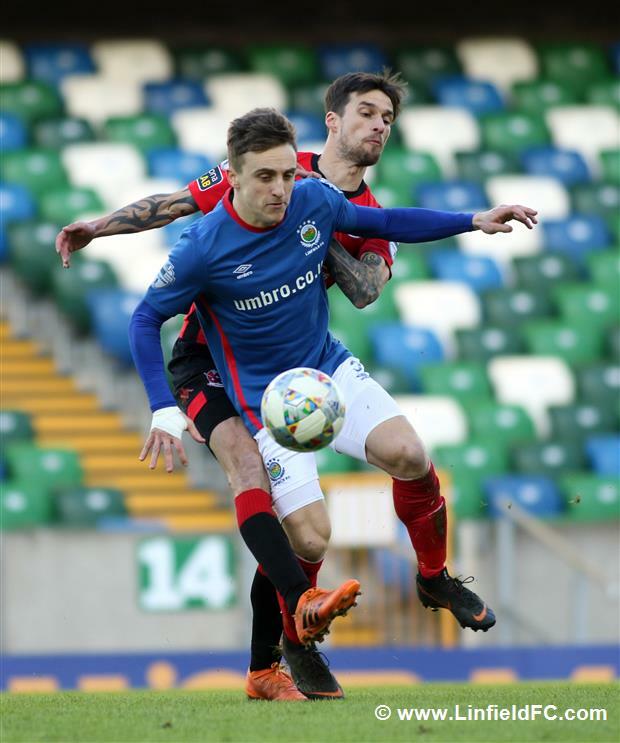 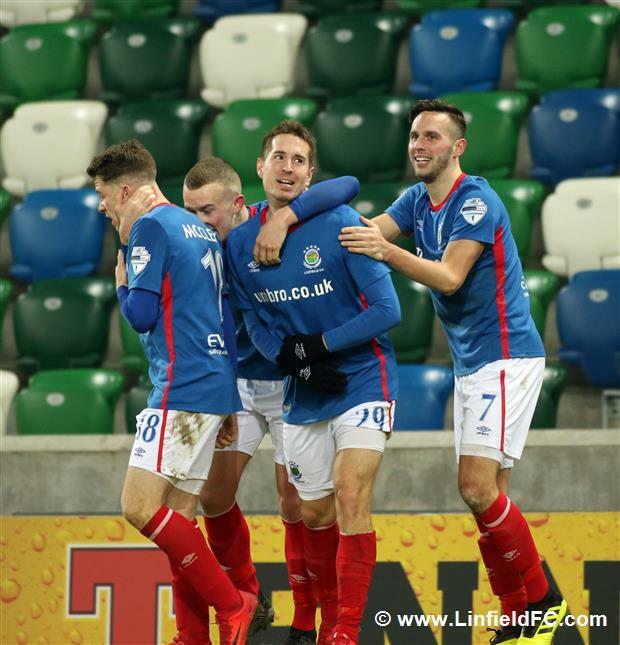 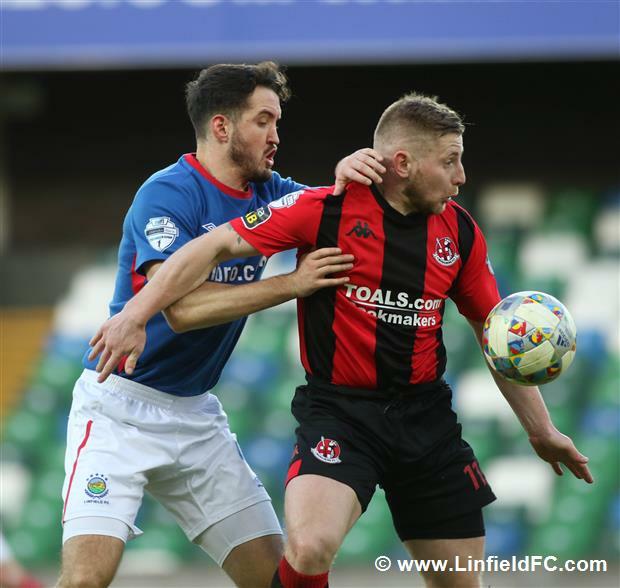 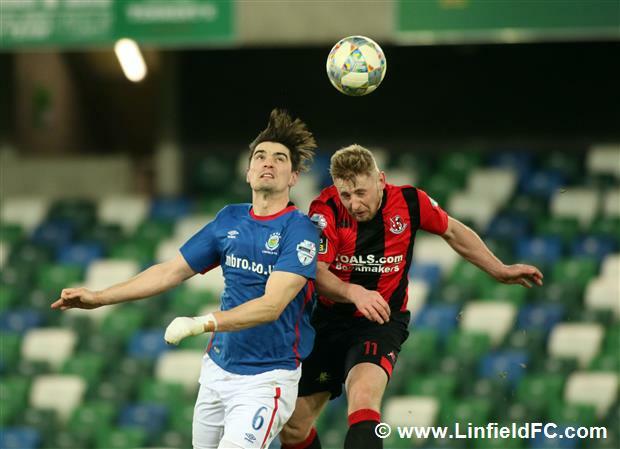 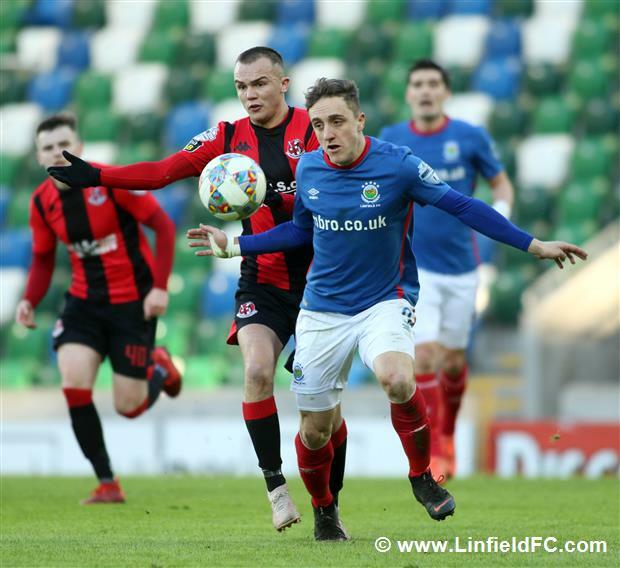 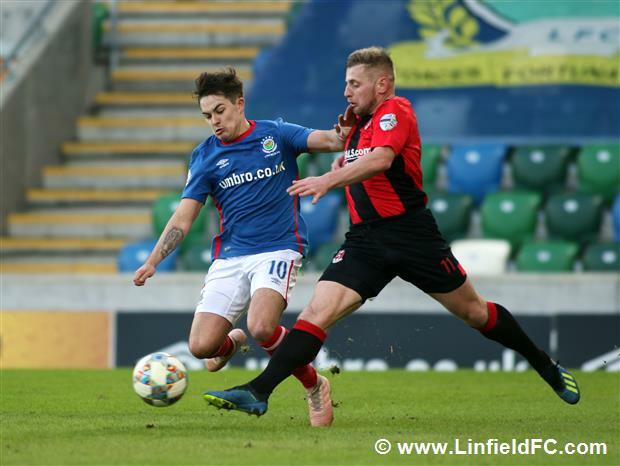 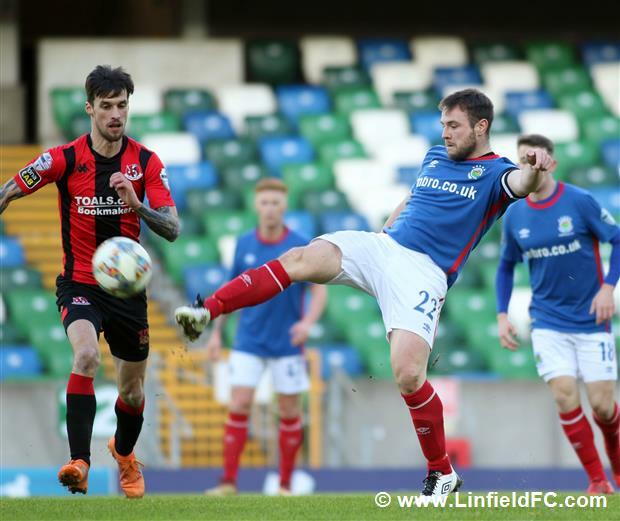 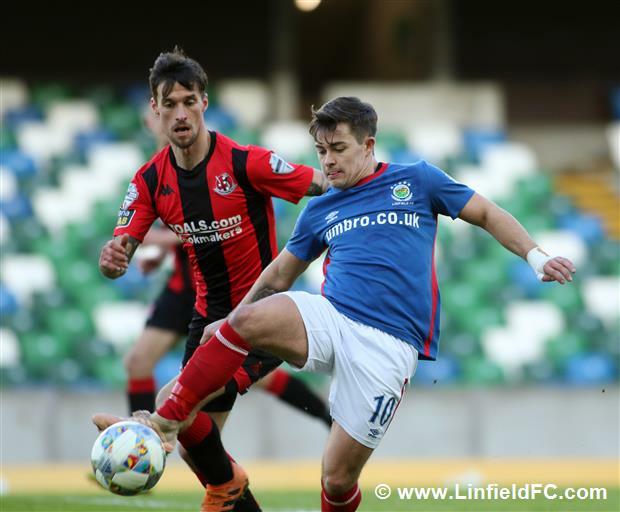 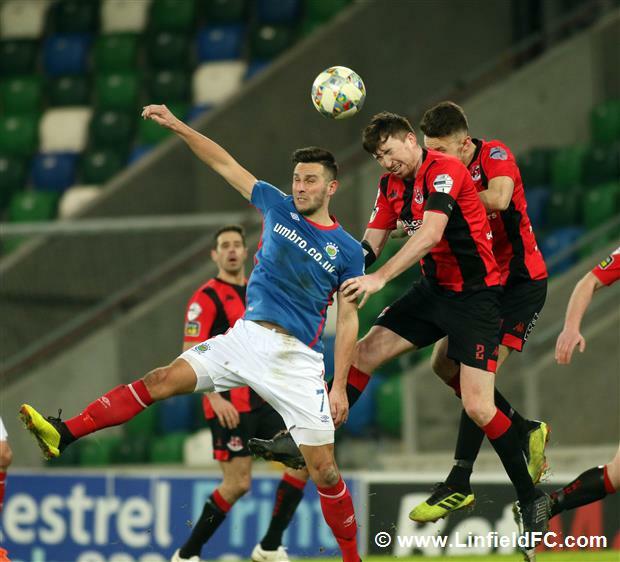 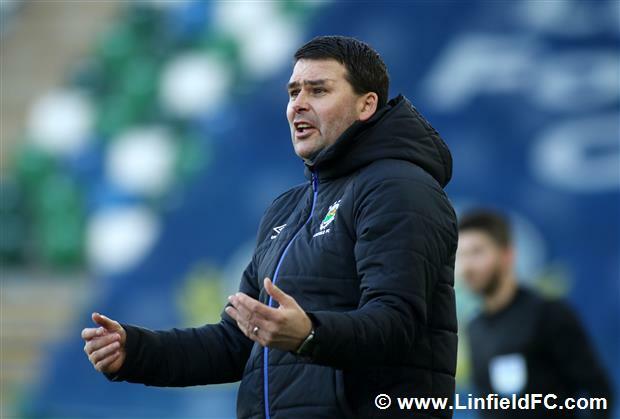 Linfield suffered a disappointing cup exit this afternoon as Crusaders struck a late winner in extra time to send them through to the Irish Cup Quarter Final. 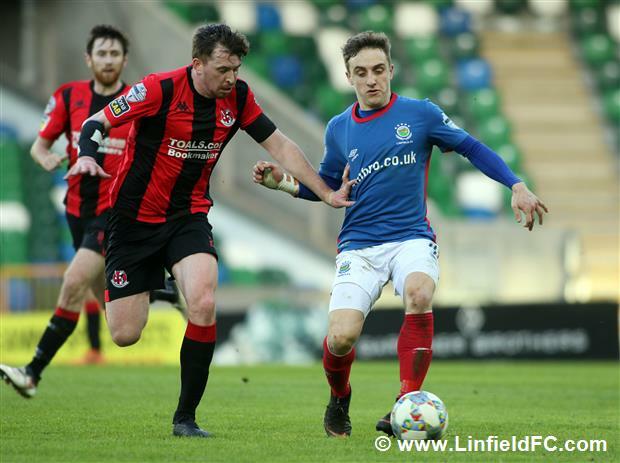 Crusaders started the game brightly and almost took an early lead. 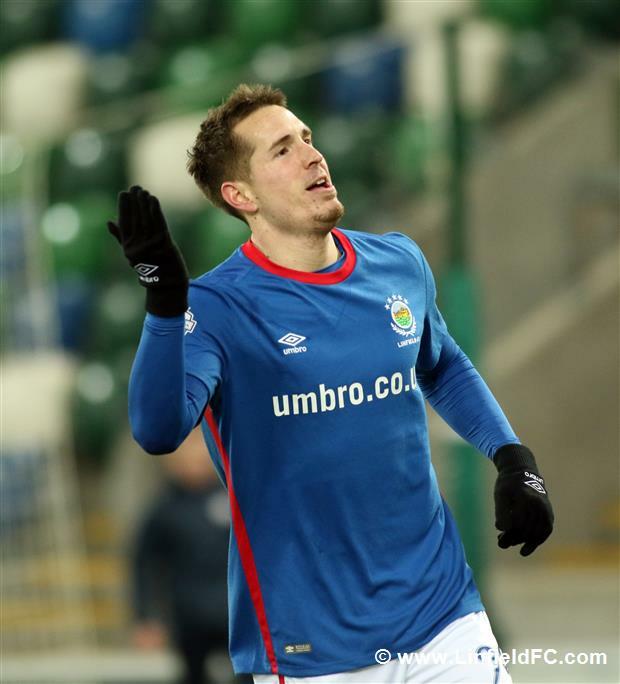 David Cushley found space in the box after casual defending and the winger fired a shot narrowly wide of the far post. 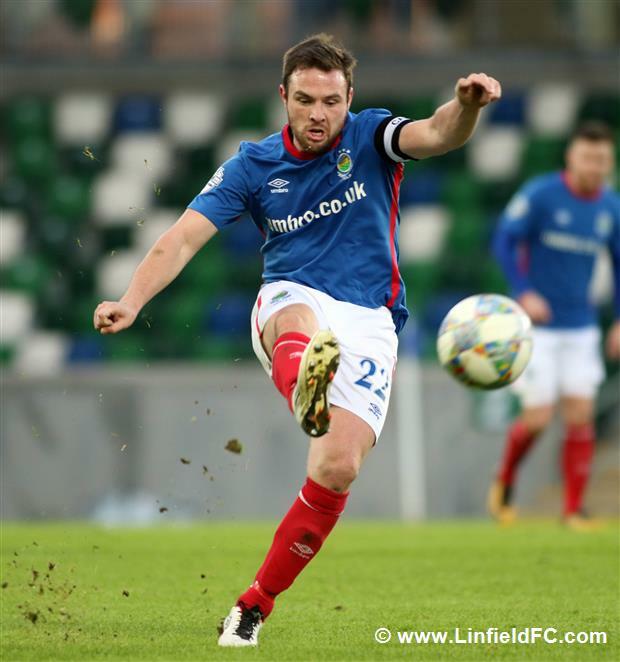 Stephen Fallon had returned from injury for a start but he pulled up injured after seven minutes and had to be replaced by Kyle McClean. 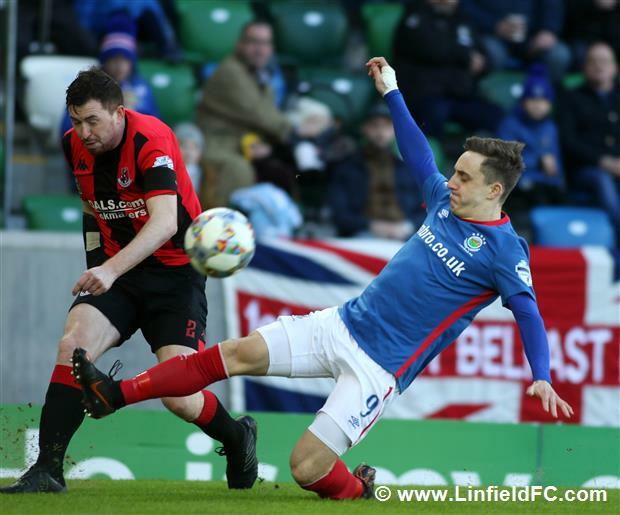 Linfield had a strong spell midway through the first half and went close as Joel Cooper brought the ball down on the edge of the box before having a shot at goal but it was deflected just wide of the Crusaders goal. 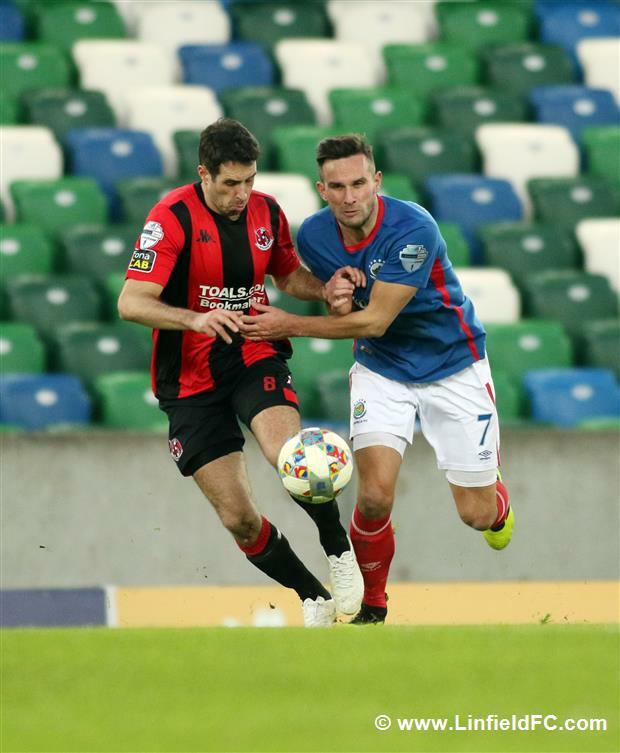 The Blues passed up a golden opportunity on the brink of half time with a swift counter attack from a Crusaders corner. 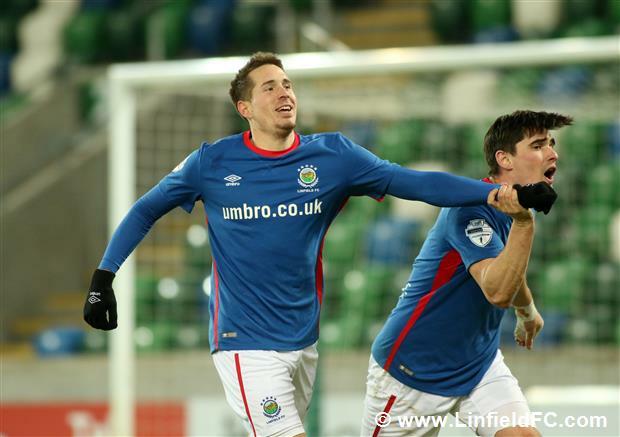 Daniel Kearns made a good run before slipping the ball across for Joel Cooper but he couldn’t keep his shot down. 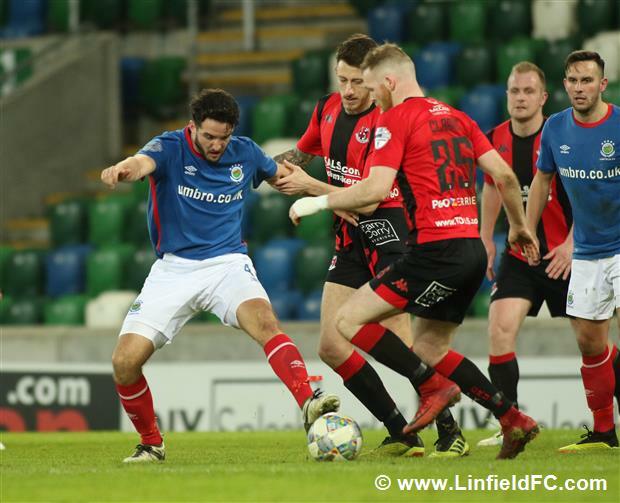 Stephen Baxter was forced into a half time change as defender Howard Beverland limped off injured. 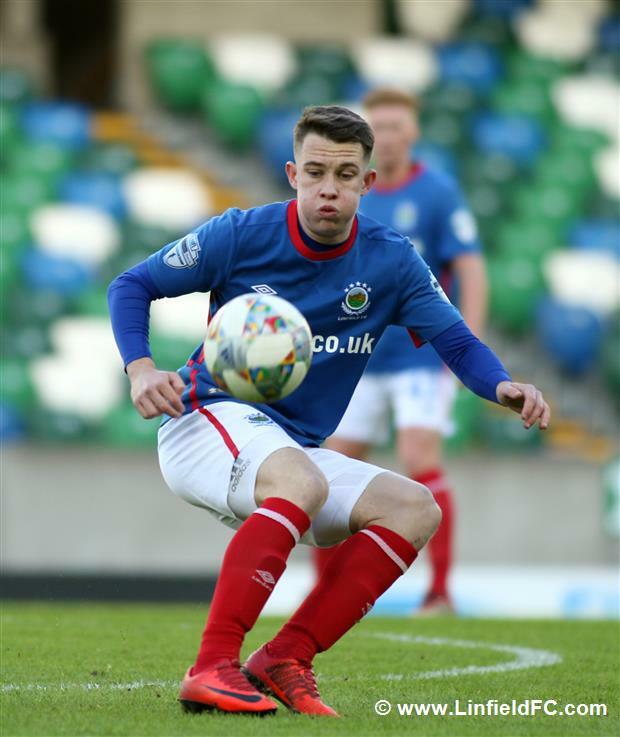 He was replaced by Jordan Owens and as part of a reshuffle BJ Burns moved to centre back beside Sean Ward, with Jordan Forsythe slotting into right back. 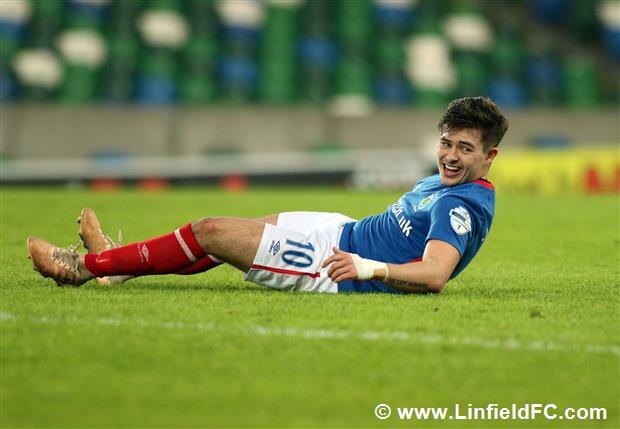 Linfield went within an inch of scoring early in the second half. 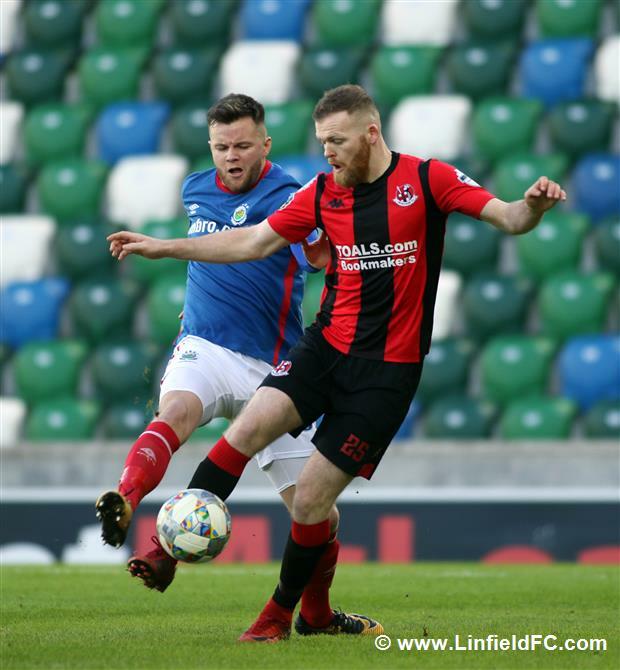 Chris Casement fired in a dangerous cross and Kyle McClean got a head to it, only to see his effort come back off the post. 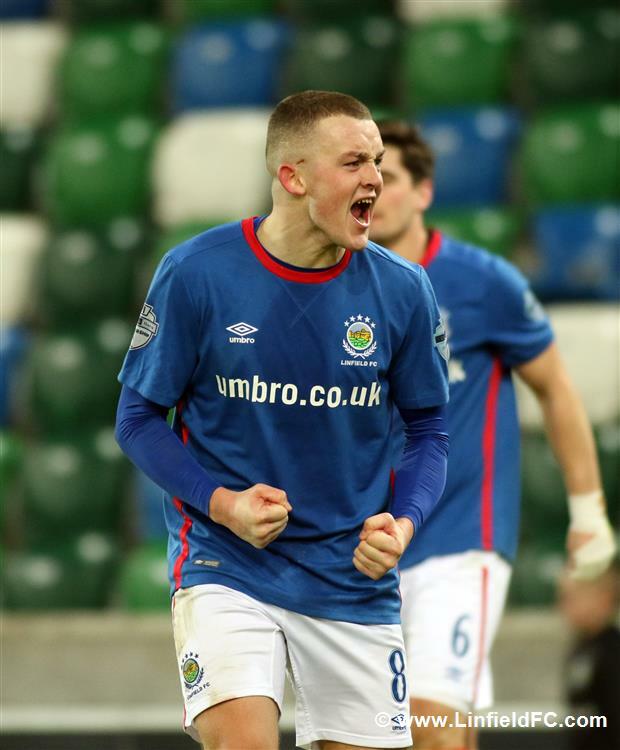 Michael O’Connor then threatened with a good effort. 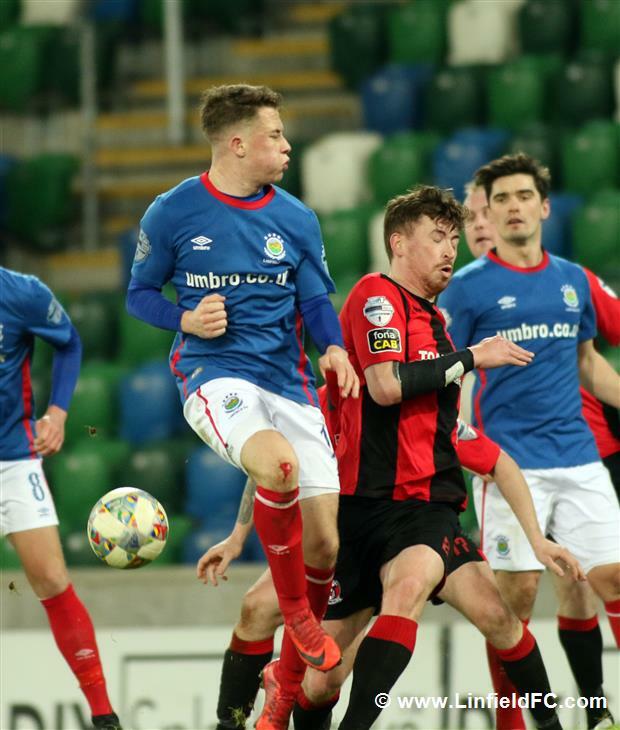 He watched the ball drop from the sky before connecting well with a volley but Sean O’Neill saved well. 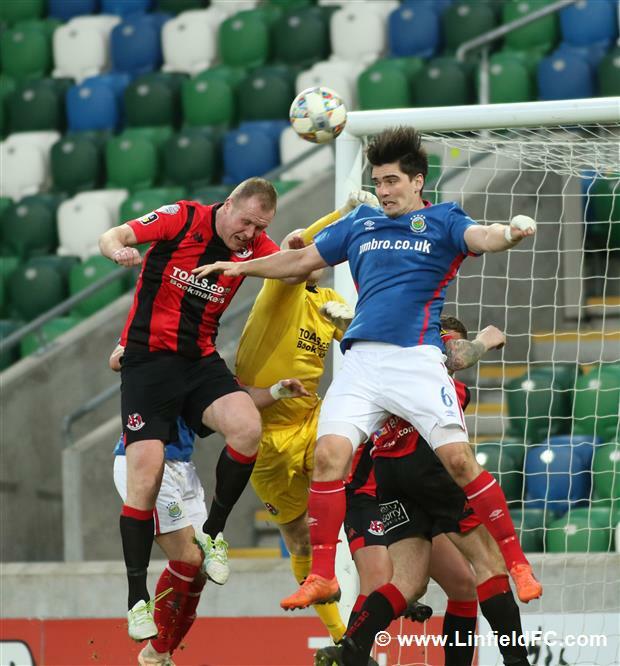 Crusaders had two separate chances soon after, and both were near identical. 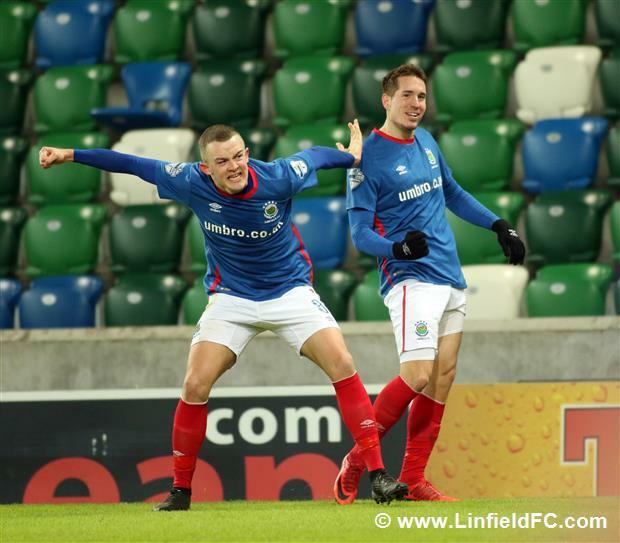 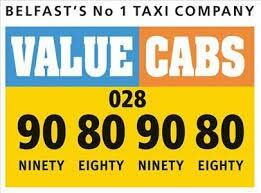 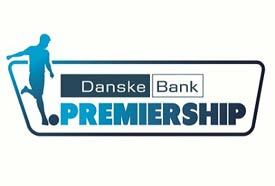 Twice Linfield failed to properly clear corners and twice Ronan Hale fired over with powerful strikes. 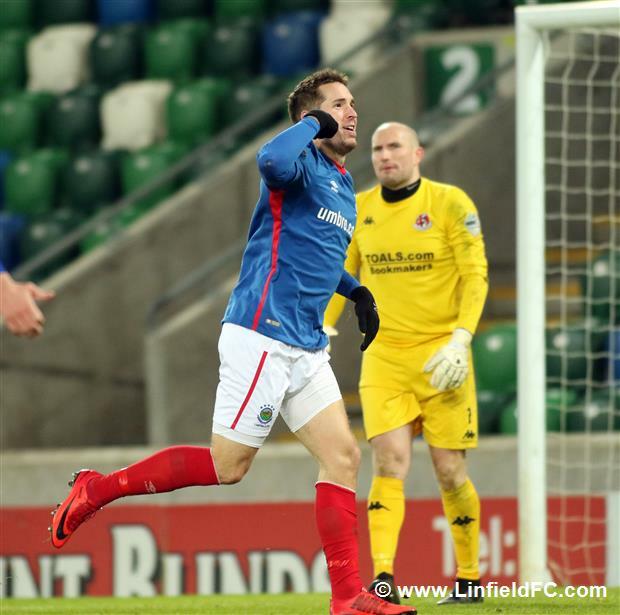 The woodwork denied Linfield again on the hour-mark. 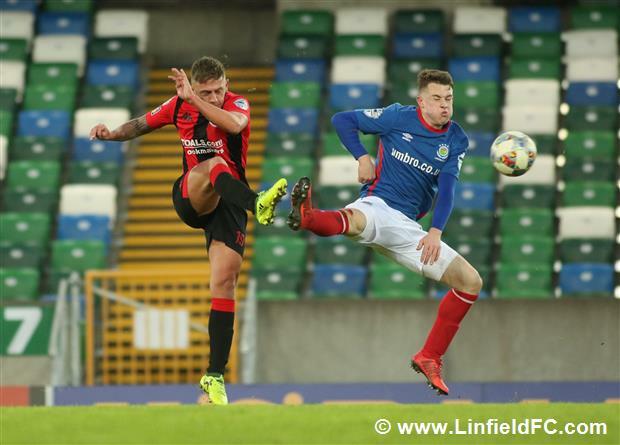 Jordan Stewart hung up a superb cross after a brilliant individual run and Michael O’Connor rose well, powering a header at goal but his effort cannoned back off the crossbar. 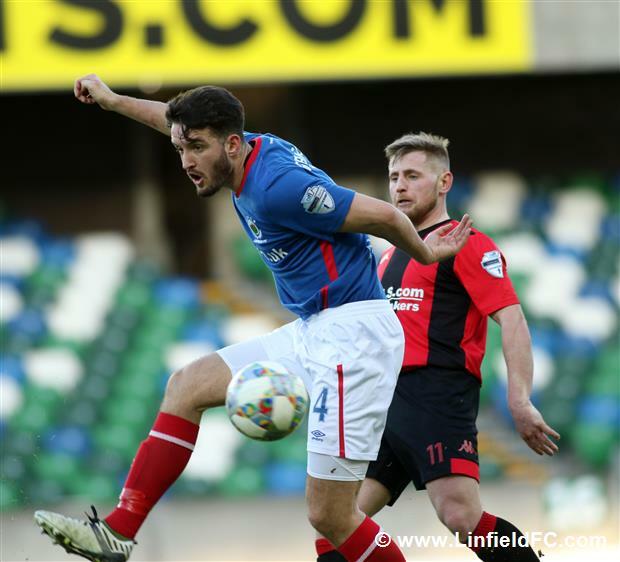 Kirk Millar replaced Joel Cooper on 69 minutes to make his 200th Linfield appearance since joining from Oldham Athletic in 2014. 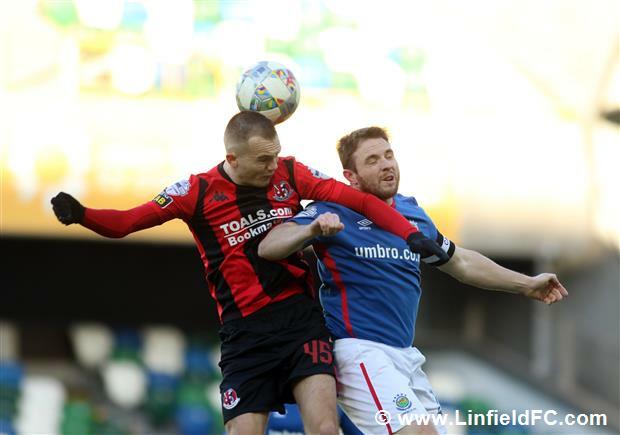 The closing stages of normal time were edgy and Linfield had to stand tall amidst a Crusaders onslaught. 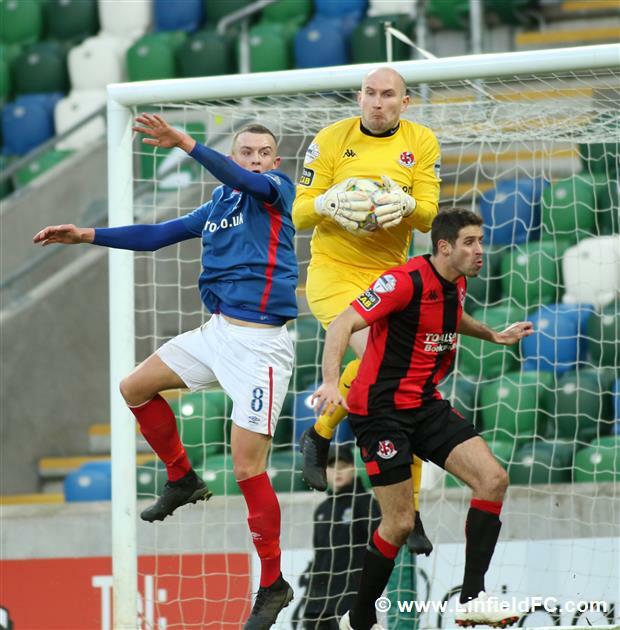 The Crues very nearly won it in the last minute with their first attempt on target but Kyle McClean made a heroic goal line clearance. 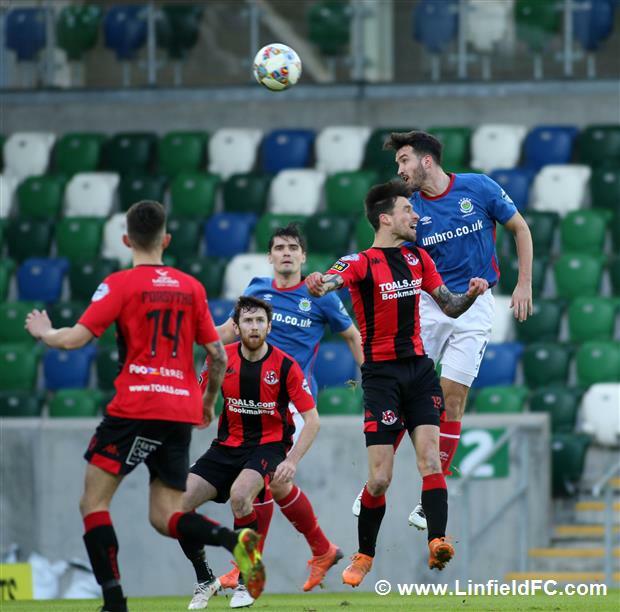 Linfield missed another good chance five minutes into extra time. 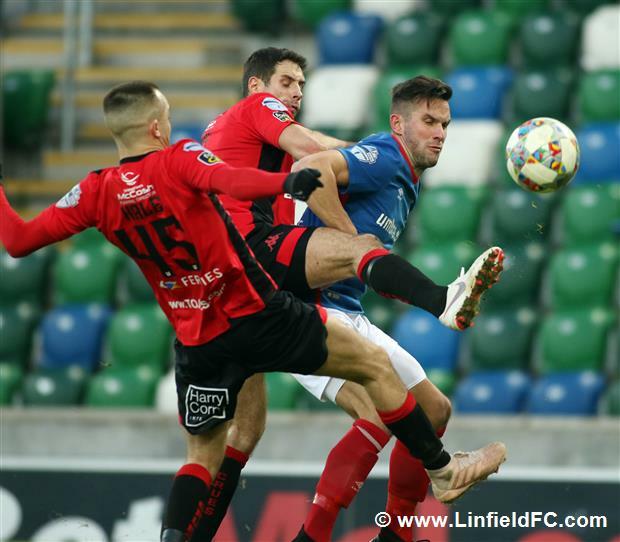 Kirk Millar picked out Andy Waterworth in the middle but the striker headed over. 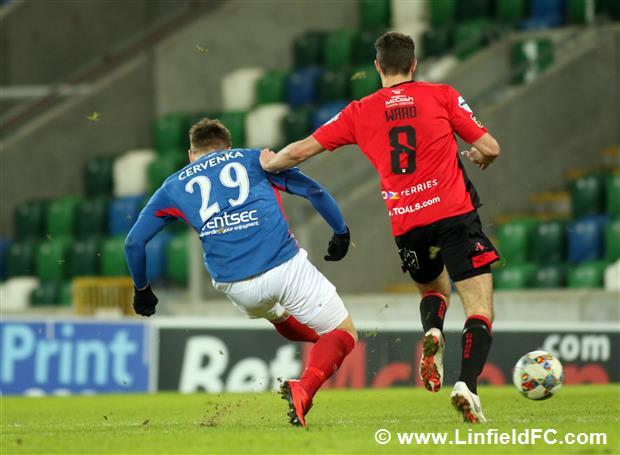 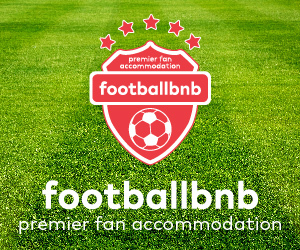 Linfield produced a dramatic leveller on 117 minutes when Czech striker Marek Cervenka pounced on a misplaced back pass to fire home a clinical strike for his first Linfield goal. 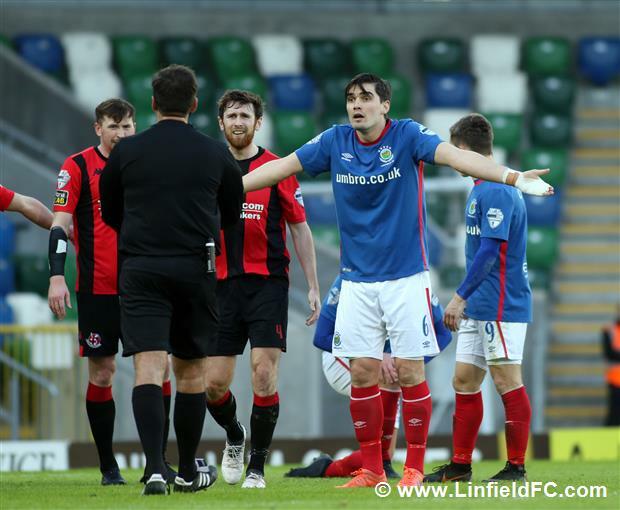 But the joy was short lived as Linfield failed to deal with a Crusaders corner and Billy Joe Burns pounced with a thunderous finish.